Hauskaa lauantaita, tervetuloa viikon Allsorts haasteen pariin! Pinkkiä lokakuuta vietetään, siis värihaaste: pinkkiä! Hi; Happy Saturday, it's time for a new Allsorts Challenge! It's the Pink October, so our colour theme is "pink". Sponsor is Swedish Hobby Crafts. Welcome to join in. These beautiful pink gladiolus' are from my garden! Kukat omasta puutarhasta ! She's a really dainty lady Mervi and pretty design. Many thanks for making a lovely creation for our pink theme. Just BEAUTIFUL Mervi! Thanks so much for joining us at The Sisterhood’s ‘PINK’ challenge and please come back again soon! 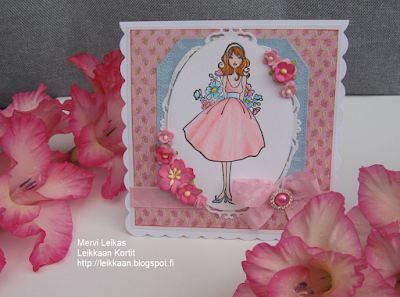 Such a pretty card Mervi! Love how you colored the image! Super image and great colouring of the folds, pretty paper and lovely design. Beautiful image and design. Thanks for joining the Crafting With An Attitude challenge. I have this stamp and die and you have done such a gorgeous job on her. I love how you colored her and made her stand out so beautifully on your card. Such a great job! LOVE IT. Thanks for joining us at Penny's Challenges. Beautifully created!! (love your flowers, too)!! Thank you for joining us at The Sisterhood for our challenge! This is so pretty, such a feminine card. This is a pretty creation Mervi, love your image.